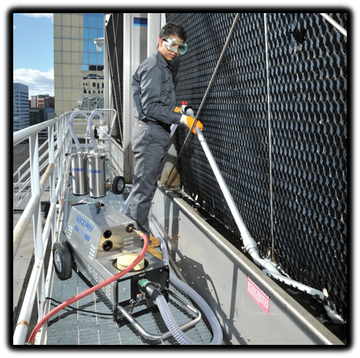 Cyrco’s commitment to responsive, client-focused service means we are constantly looking for new new solutions; new and improved ways of handling cooling tower maintenance issues. For factory-assembled cooling towers, we are pleased to announce a faster, more efficient cleaning service utilizing the cooling tower cleaning product from Goodway Technologies. Our trained technicians can vacuum out the algae, mud, and other sediment in your cold-water basin that decreases your cooling towers efficiency. We can filter the sediment and return water back into the system with no loss of water treatment chemicals. It's not too soon to start planning for a regular spring or fall maintenance cleaning. Call us at 800-424-6128 to get more information about our new service.